• Alfredo Aceves is here, but he’s still going to have at least one more rehab start, probably more. Cashman said Aceves is being evaluated “on an outing-by-outing basis” and there’s not set date for his return. • There’s a chance Aceves will be stretched out, but that doesn’t necessarily mean he’ll be considered as a rotation option. “Arm strength-wise, it would probably help to stretch him out,” Cashman said. • Berkman’s DL stint should be retroactive to August 16. Berkman said he expects to be ready to play as soon as his 15 days are up. “Unless I fall down the stairs or something,” he said. • Joe Girardi said he’s not sure if or when the Yankees might need to skip a Phil Hughes start to keep his innings from getting out of control, “because I can’t tell you what (number of innings) every start is going to be,” Girardi said. • Off days on the schedule will be a chance to rest all five starters, not necessarily a chance to skip Hughes. “It will probably be an extra day for everyone,” Girardi said. More on the offense explosion in a little bit. A-Rod left the game with tightness in his right calf, no tests have been scheduled and he has been listed as day to day. My guess is that A-Rod will sit out tomorrow and Girardi will give Ramiro the start at 3B. Swish also left with tightness but in his right forearm, no test have been scheduled for him either and he also has been listed as day to day. I really hope Swish plays tomorrow since I will be attending the game, I will be sitting in section 203 and I would love to him salute us. Nick Johnson's (remember him?) wrist is hurting again, his return to playing baseball this year looks grim. The Yankees have "sharply limited" Javy Vazquez between start work due to his Little Leauge World Series fastball. Xavier Nady's season is over and next year is in question, too, the New York Post has learned. According to several teammates, the Yankees outfielder told them late Thursday night that his right elbow requires Tommy John surgery, a procedure that often takes 12-14 months recovery. Reached today, all Nady said was, "I am going to have a lot of time on my hands." Nady, a free agent at the end of the season, felt something in the elbow in the third inning of a Triple-A rehab game Thursday night and removed himself two innings later. He plans on being at Citi Field today and is scheduled to see Dr. Lewis Yocum in California. Yocum performed the same surgery on Nady in 2001. According to the Nady, "There was no reason to do tests" today. "It's disappointing," said Joe Girardi, who didn't confirm that Nady needs surgery to repair a ligament that first bothered him April 14 and forced him from a game against the Rays. "I am more disappointed for him than I am the club. You would love to have him back. He has put a lot of time into this. I know how bad he wants to play." The fact that Nady, 30, is headed to Yocum told Girardi the problem is serious. "My gut tells me it is injured again," Girardi said. "Him going to see Yocum tells me it's more than what he felt in Tampa." Though Girardi had Nady only for seven games (in which he hit .286 with two RBIs) and there was no guarantee of having him back at some point, quietly the Yankees were hoping to have Nady's right-handed bat to help out in right field, where switch-hitter Nick Swisher is playing every day. Now that won't happen. And though GM Brian Cashman said this week "a bat isn't needed," knowing that Nady isn't returning might change the Yankees' mind. Nady was acquired from the Pirates with lefty reliever Damaso Marte last July and batted .268 in 59 games. Marte is currently on the disabled list with an injured shoulder and nobody can predict when he will be back. I have very mixed feelings about this. On the one hand, I feel terrible that Nady has suffered such a severe setback - he has an excellent reputation within the clubhouse and, after steadily improving year-to-year, had a large leap in production in 2008, appearing to put it all together. It's a shame that he will likely be unable to play again until this time next season (at the earliest). On the other hand, many fans were eager to see Yankees deal Nady, as he had more value than any other outfielder. While the return wouldn't have been much, the Yankees may've been able to acquire a better bullpen option than Veras or a better infield option than Berroa. This is, of course, hindsight - but it is something to consider. In the end, the Yankees probably did the right thing in holding onto Nady, Swisher, and Cabrera. The team is somewhat old and fragile, and depth is a very good thing to have. While Nady is very unlikely to have much of an impact this season, barring some sort of miracle, it seems both inane and inappropriate to lambast the organization for holding onto him. Bad news for Nady. In the sixth inning of Scranton's game he felt pain in his arm. This could mean he'll have to undergo the season ending surgery he was hoping to avoid. I'm really looking forward to seeing him in back in the Bronx and hopefully this is just a minor setback. I don't know why, but this took me completely by surprise. Posada will be activated off of the DL today and I would logically assume that he will be behind the plate today. Kevin Cash has been DFA'ed which I think is a smart move. He really has little to no value to the Yankees and Fransisco Cervelli has clearly outplayed him thus far. Their are some conflicting reports about whether or not Melky is available tonight so I guess we'll have to wait until game time to find out. Nothing new on Xavier Nady, Damaso Marte, or Jose Molina, but hopefully all those guys will be back soon. Wang: “Performance-wise he was terrific. This was a much better hitting club. Columbus is a much better offensive club than the team he was facing last time, but his stuff was better last time to be honest. Although he performed great in both outings, he didn’t have the slider that he had last time. His changeup was better today than last time. His fastball velocity was a little bit lower this time than it was last time. “At the same time, he handled the lineup and got a lot of groundballs. Facing guys like (Travis) Hafner kind of tells you a little something you want to know. I know Hafner is on a rehab assignment and he’s a guy who can really do some damage if you’re making mistakes, not making some pitches, and he made his pitches. That tells you a lot. Kennedy's injury is not a vasopasm but an aneurysm. Pete Abe broke the news yesterday. Obviously, this is really terrible news and is awful news for Kennedy. Hopefully, he can come back and make the majors when he's healthy again. So, after a two hour rain delay, the Yankees finally played a barely watched game, lost a close one to the Sox again, AND now Posada's hurt. Awful. Let's just pretend yesterday never happened, okay? Let's not all rush to crucify Girardi, Bruney was unavailable. His headed back to New York for an MRI. Unfortunately, he needs to have his elbow checked out which is never a good sign. Ransom had a rare good game and of course, now he's hurt. He has a tear or something in his quad which sounds pretty bad. I doubt he'll be back before A-Rod and if his replacement plays well then he might not see a ML roster for a long time. More on this later. Wang has been sent to the 15 day DL. They're calling it weakness in the hips which just means rehab. I'm not buying that though. It seems kind of obvious he's just not ready to face ML hitters and needs some time to get back into shape. Hopefully, that all their is. Phil Hughes would have been the clear choice for a callup anyway but he's pitching to the tune of a 1.86 ERA down there so far. Aren't you glad we signed Andy Pettitte now? Update 12:06- According to Pete Abe the word from Scranton is that Mark Melancon is on his way to Fenway. This is not good news for Bruney. Update 12:14- Berrora has been called up for Ransom and Robertson has been called up to take CMW's spot. Nady has decided to try to rehab without surgery on his arm which means things are looking up. Girardi said he could be up and swinging in 3 weeks. That will give Swisher ample time to get comfortable in Right-Field. However Nady is a great player and we want him back A.S.A.P. I just realized that I've neglected to make a post on losing Nady. Its still unclear whether he'll be out for the season but its clearly pretty bad. At this point, trading Tabata looks pretty bad. On the bright side, he won't be stealing playing time from Nick Swisher anymore. 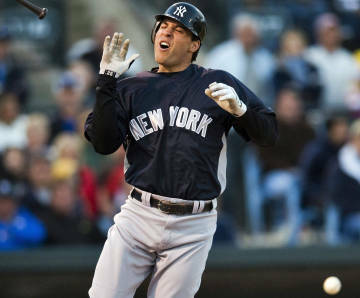 However, Girardi was using him well to rest Teixeira, Matsui, Damon, and Nady/Swisher. Now, they're very vulnerable to injury. Hopefully, he won't need Tommy John. Most Imporantly from Pete Abe: Xavier Nady had a “sharp pain” in his right elbow in the seventh inning and was taken out of the game. He previously had elbow surgery. MRI tomorrow. Burnett pitched a gem going for 8 and only twirling a no hitter through seven. Swisher was well Swisher. He went 2-4 with a double and Home Run. Jeter hit a sick HR in the 9th to seal the deal. Bruney slammed the door shut with 3 quick outs. RAB has a good minor league update. Seconds after I made my last post I saw this at RAB. What's interesting is that it says he'd only be out for 6-9 weeks. Which probably means something closer to 10. Take it with a grain of salt but if its true then that's very good. EDIT: Pete Abe actually broke this story so I guess its legit. Now it looks like A-Rod will not only miss the WBC, he will also miss April and possibly more. Obviously, having Cody Ransom or Angel Berroa replacing Alex Rodriguez is not a viable option. Berroa has been very consistently awful in recent years and I have very little faith in Ransom. An long-shot for the job could be Eric Duncan and right now I bet the Yanks wish they invited him to Spring Training. Still, I`d be shocked if he won the job. The only free agent out there is Mark Grudzielanek. He's decent and I couldn't complain if they signed him but I`d aim a little higher. Personally, I`d still like to see them trade for Martin Prado. A while back I suggested trading Nady for a package involving him and it still makes sense. The Braves still would like another outfield bat and Nady, coming off a career year, can supply it. Prado is young, a solid hitter, and a good defender. When Alex comes back, Prado can play a few different positions and can act as the super-utility man. Or we could get really crazy and stick Teixeira at third and Swisher at first but I doubt that happens.